Slash fic waiting to happen. 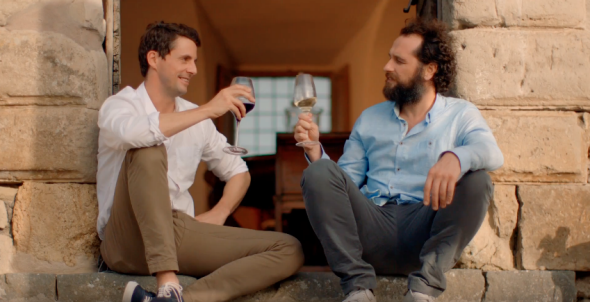 Impossibly sensual British accents meet impossibly gorgeous landscapes in this new trailer for “The Wine Show,” a new ITV series that renders every other travel show, documentary series, and audiovisual broadcast immediately irrelevant. In it, the seemingly arbitrary duo of hot, blue-eyed actor Matthew Goode and hot, blue-eyed actor Matthew Rhys travel from piazza to lanai to mountaintop villa in search of “stories that not only tell us about wine, but about the world we live in today.” It’s basically a reboot of The Trip to Italy, but with two men you’d actually want to accompany on a trip to Italy. The Matthews admit that they’re no wine experts right from the start. “Wine,” one of them murmurs. “Made all over the world, enjoyed by millions, but still mysterious to many—including us.” Their adorable ignorance recalls every winery tour most people will ever take: full of dumb questions, tipsy titters, and crinkled laughing eyes that melt hearts through computer screens. These are just two friends who love drinking and looking at beautiful things—especially each other—and doing cute stuff, like bicker affably over driving directions, that will surely inspire a deep Internet archive of slash fic. One of the most charming parts of the trailer, and probably the show, is the uncanny similarity between their voices. “I’m Matthew Goode,” says one of the Matthews. “And I’m Matthew Rhys,” adds the other. But it could totally be the same Matthew and no one would know. Other delights: Rhys, who is about to have a real live spy baby with The Americans costar Keri Russell, sports a grizzled beard and a pinstripe shirt unbuttoned down to there. Goode describes sparkling wine as a “glass of giggles” and adopts a look of startled constipation when he learns that the glass of wine he’s holding costs more than £100. It’s enough to make the average wine n00b wonder what it might be like to finish off a bottle of “giggles” or two with the pair, maybe take a tromp through the vineyard and, you know, just see where the night takes us.